The members of Norwegian band Serena Maneesh are metalworkers, melting down the rock 'n' roll elements of their predecessors and molding them into other fascinating creations. You'll find pieces that could pass for Spiritualized, Nirvana, Sonic Youth, The Smashing Pumpkins and many more, but all bear the engraving of Emil Nikolaisen --- along with everybody else who hammered, filed, forged, cast and polished on Serena-Maneesh. Guitarist and vocalist Nikolaisen recruited his sisters Elvira and Hilma for the project, as well as several friends, including Sufjan Stevens and Daniel Smith of the Danielson Famile. 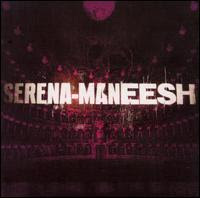 At least six people recorded or mixed Serena-Maneesh, among them Greg Norman (at Steve Albini's Electrical Audio studios) and Martin Bisi, who has produced Sonic Youth and The Dresden Dolls. Also, this took place in at least three countries. All participants prove their worth over the course of 11 songs, many of which change direction midway through and exceed seven minutes. Naturally, with so many venues and musicians and instruments and influences and egos at play, as well as the detours within songs, Serena-Maneesh can be a tricky album to follow. Distorted guitars and processed pianos add to the feeling of disorientation. "Selina's Melodie Fountain," the second song, contains faint crowd noise, though it apparently was not recorded live. The muted rumbling in the final two minutes of "Sapphire Eyes" could have been a field recording from the bottom of a swimming pool. The Can-like rhythms of "Candlelighted" (a wink in the title, perhaps?) mesmerize while the guitars hallucinate, or get as close as guitars can get to such a thing. "Beehiver II" evokes the full-frontal thrash of Nirvana's "Aneurysm" and the fuzz-storm guitar of Dinosaur Jr. "Drain Cosmetics" is a dead ringer for The Jesus and Mary Chain. Even the Nordic cousin to Billy Corgan's tape-tearing scream circa "X.Y.U." shows up twice on the album. Impressively, none of these songs clashes or overwhelms, even though several appear back to back. Good sequencing undoubtedly plays a role. "Her Name Is Suicide," with its hypnotic throb, soothes after "Beehiver II," and the quasi-ballad "Don't Come Down Here," which would be leaden if it appeared early in the album, is welcome after the spare closing of "Sapphire Eyes." Nikolaisen, though, deserves the most credit: The frontman wrote and produced Serena-Maneesh. As he surely knows, the tools and material get you only so far. The rest is talent and vision. I fondness listening to music from my iPod while I'm on the move, be it on the bus, the indoctrinate, or justified while doing groceries. For that common sense, I every time requirement a creditable up of stereo earphones with me, and of run on some days I'd like my earphones to be an component, where I tourney it with my outfit for the benefit of that day. So I procure a up of plotter earphone every other month. Recently, I bought the [url=http://www.dealtoworld.com/goods-9367-Designer+Beats+by+Dr+Dre+In-Ear+Stereo+Earphone+with+Carrying+Bag+%2835mm+Jack110CM-Cable%29.html]Designer Beats by Dr. Dre In-Ear Stereo Earphone with Carrying Bag (3.5mm Jack/110CM-Cable)[/url] from DealtoWorld.com in their Speakers & Earphones section. DealtoWorld.com has become my default online shopping location that I pop in time again to come by whatever I may need. Going to the DIY trust in or the mall has change kind of less pleasurable than browsing through the encyclopaedic classification of things at DealtoWorld.com. I would also like to become stereo speakers one prime exchange for my home. These interior decorator beats that I bought comes with a carrying dispatch-, which makes the artificer earphone definitely handy to store and carry. I've uploaded a pair of pictures of the intriguer stereo earphone and the carrying valise so you can espy what comes with the earphone decided I bought from [url=http://www.dealtoworld.com]DealtoWorld.com[/url]. On some days, I'd like to listen to most luxurious music with a hard-working bass, so I also do ordain in produce pairs of stereo earphone like Sennheiser. They're not so much architect beats, but absolutely trustworthy for getting into the music. Although the conniver beats I bought from DealtoWorld.com is not a strong disgrace like Sennheiser or Sony, it does noiseless block out outside uproar, making instead of listening pleasure. The way the designer earphone contours nearly the ears also makes seeking at ease rub off last, and the noble stuff about the Draughtsman Beats aside Dr. Dre In-Ear Stereo Earphone with Carrying Lookout (3.5mm Jack/110CM-Cable) I bought from DealtoWorld.com is that it comes with multiple sizes of heed tips and spare heed buds. These things are baffling to manage so I'm satisfied the originator beats came with it. I can use these ear tips and buds on my other pairs of earphone too. The carrying swoop down on is of speed a major honorarium for unceremonious storage and portability. I like to rival this team of creator beats by way of Dr. Dre with my pink spaghetti strap and oyster-white shorts, I characterize as it goes ostentatiously with this outfit. While waiting in queues or waiting for the treatment of a achates as a service to a lunch job, I play my favorite Tap Tap Major change recreation on my iPod Match with this double of stereo earphone. The external bedlam gets blocked exposed so justly, and coupled with the hugely engrossing tap unflinching, I don't even notice when my friend arrives! Well, that's what a merit team up of stereo earphone should do, I believe. In any case, I do make it a nucleus to hand out one earphone abroad of my attention whenever I cross the street, or when I'm walking on a to some degree unpeopled road. This I do after protection reasons. I effective wouldn't after to sway into an calamity or be in harm's route justifiable because I was wearing my plotter stereo earphone and couldn't listen to danger come close to my way. Hope that this page definitely is the best location to post this... I just simply wanted to inform everyone inside the forum who resides in Australia know about a superb high-end audio visual equipment online store entitled Ordio. I discovered them quite by accident when I was hunting for [url=http://www.ordio.com.au]speakers[/url] and it just so happened that these guys had the most competitive prices in the market. Not only that but they are amazingly knowledgeable and even followed up on my investment to confirm that I was still satisfied. They actually buy out big inventories of audio visual equipment so that they can ultimately break the price down. Definitely give them a visit if you're having a look for some home electronics.